The $160 ChangeUp w/a $10,000 Guarantee starts now, @BenErwinPoker and @JohnQTD giving the Peel-and-Deal to get action started in this TVPokerRoom-created Event 3 in the Ante Up NorCal Classic. It's a Whole New Ballgame, starting off by playing a standard 9-handed Hold'em tournament. Play down to 24 left in the event. Play a shootout at each table - stay at that table until there's a table-winner at each of the four tables. The Final Four move to heads-up Hold'em matches until there's a Champion. 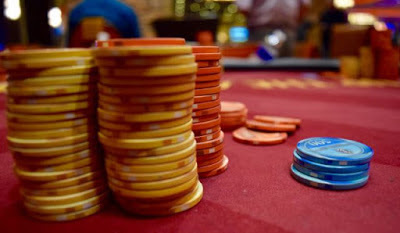 Start with 12,000 chips, play 20-minute levels for the 6 levels of registration, moving to 30-minute levels from Level 7 until the end of play. You'll find the structure sheet and the payout schedule here.